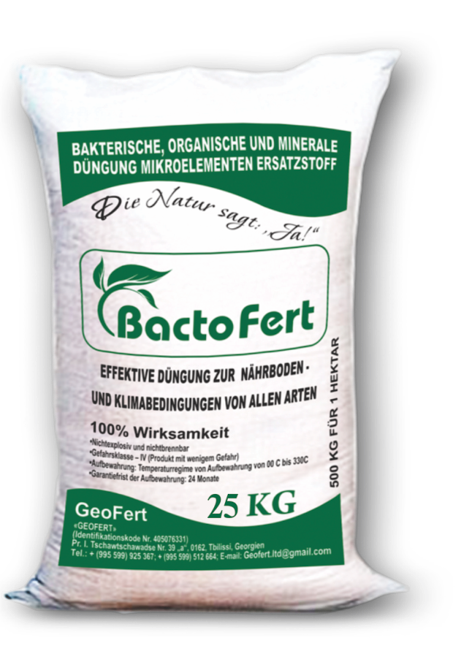 Bactofert Big bag - 1 T.
BACTERIAL, ORGANIC-MINERAL FERTILIZER WITH MICROELEMENTS, BASED ON ZEOLITE FOR ALL SOIL AND CLIMATIC CONDITIONS. 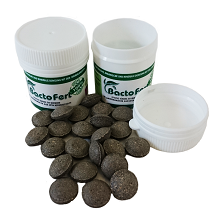 “BACTOFERT 1.5 kg” Recommended for fertilizing any flowers, vegetables and fruits. Microorganisms getting in the soil, are regulators of vital functions. In the process of their vital functions they produce agents able to provide stimulating influence on growth and maturity of plants. In the vegetable cultivations significantly increase their germination, energy and the speed of intergrowth. On sprout transplanted in soil fertilizers “BACTOFERT” reveal as perfect root makers. The survival ability of plants improves, they get powerful root system formed. After cultivation of grown-up plants with humic regulators they become growing faster, earlier blooming, their crop yield increases by 30-40%. It should be noted that fertilizer “BACTOFERT” not only increases crop yield, the sizes of fruit and speeds up the dates of ripening, but also significantly improves product quality. For example, increases quantity of sugar in beet, vitamin C in apples and other fruits, decreases contain of nitrates in vegetables. After soil watering, where fertilizer “BACTOFERT” is injected, which contains humic agents, soil microorganisms vital functions activate, as a result of what decomposing of plant defensive chemical agents accelerates, the production is ecologically cleaner. Improves the structure of soil, its water-air and thermal regimes, the natural processes of humification accelerate and soil is enriched with humus. Fertilizer “BACTOFERT”, as a product of natural origin, ecologically clean, is harmless for human health, does not accumulate in plants. 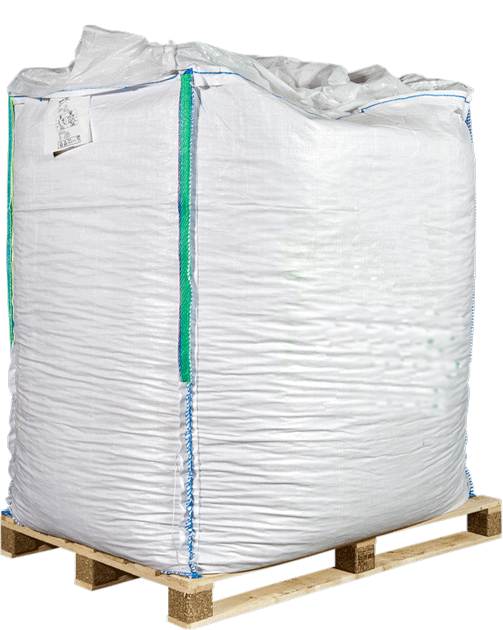 Fertilizers for small farms. Effective tool for environmentally friendly and rich harvest for your home. “BACTOFERT” not only increases crop yield, the sizes of fruit and speeds up the dates of ripening, but also significantly improves product quality. The survival ability of plants improves, they get powerful root system formed. After cultivation of grown-up plants with humic regulators they become growing faster, earlier blooming. The effect from applying bacterial organic-mineral fertilizer “BACTOFERT” is equally high as in the open soil, also in hotbeds and hothouses. It should be noted that fertilizer “BACTOFERT” not only increases crop yield, the sizes of fruit and speeds up the dates of ripening, but also significantly improves product quality. For increase of agricultural crop yield and getting ecologically clean production the bacterial, organic-mineral fertilizer “BACTOFERT”® is produced by us, which is get in consequence of biological influence of soil microorganisms and the products of their metabolism (vitamins, ferments, hormones, amino acids) on natural raw materials: zeolite and Leonardite (brown coal). It combines the properties of organic, mineral and bacterial fertilizers and that is why it possesses a wide spectrum of actions. 1. Energy – accumulation, mobilization and dosing of the elements of nutrition in soil. 2. Physiological – acceleration of vegetation (blossom) and ripening of all the kinds of agricultural crops, increase of soil microorganisms and stimulating of their action, increase of humus content. 3. Protective – protection of plants and useful microorganisms from the impact of harmful agents, increase of plants’ resistance to negative climatic factors. 4. Structure-forming – improvement of structure and physical properties and water-air balance of soil (aeration, water-absorbing capacity and acidity decrease). 5. Ecological – eliminating of soil, underground water and atmosphere pollution. - Associations of soil microorganisms of different physiological groups. Including: Zn<0,005%; Cu<0,0006%; Mn<0,0006%; Co<0,0003%; Mo<0,0007%; B<0,27%; KIO <0,0003%.